PRODUCT DESCRIPTION: Granulated product with iron that helps correct Chlorosis (yellowing of foliage) and help restore soil to a healthy state. 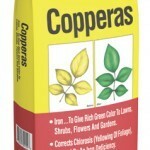 Copperas can also be used to lower soil PH. The iron gives a rich green look to lawns, shrubs, flowers and gardens. RATE OF APPLICATION: A 4 lb bag can cover up to 1,000 sq ft of lawn. Apply 2 lb's per 1000 sq/ft of lawn and then another 2 lbs per 1000 sq/ft 2 weeks later. Try to apply before an expected rain or water in overnight.